Nates Spitfire Jiggs the Cão dos Mourey at 3 years old, weighing 190 lbs. Color is all shades of Brindle but dark brindle is preferred, a white chest patch and/or slight white on extremities are common. The Cão dos Mourey is very devoted to all members of his family but can be aloof with strangers. They are instinctively protective of their family and property. They require early controlled socialization. They are tolerant of other dogs and animals if properly socialized but may sometimes try to dominate other dogs if the owners are not there to communicate to the dog that is an unwanted behavior. They respond well and enjoy training. Obedience training is a must. The Cão dos Mourey is a culmination of a 35-year vision based on the English bandogg or the gamekeepers dog. Research and selection of foundation stock began in 1975. The primary breeds chosen were the mastiff, bulldog and terrier. The Cão dos Mourey is a very large and extremely powerful protection dog and is not suitable for everyone. It needs an owner who has a calm, but firm, natural authority over it. Designed as a close proximity worker with exceptional short burst speed and extreme power, courage, determination and braveness are part of his characteristics. He is extremely loyal and docile to his family. The Cão dos Mourey has a calm disposition, with self-confidence. An unsurpassed guardian of family and property. The Cao dos Mourey’s movements are free and effortless with a powerful stride and unsuspecting speed coming from such a large dog. In repose his expression is calm and self-confident; when at attention his expression reflects determination and vigilance. The objective in training this dog is to achieve pack leader status. It is a natural instinct for a dog to have an order in their pack. When we humans live with dogs, we become their pack. The entire pack cooperates under a single leader. Lines are clearly defined and rules are set. Because a dog communicates his displeasure with growling and eventually biting, all other humans MUST be higher up in the order than the dog. The humans must be the ones making the decisions, not the dogs. That is the only way your relationship with your dog can be a complete success. No major health problems. 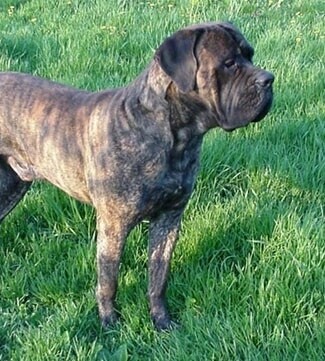 Due to the large size and mastiff lineage one must be aware of hip dysplasia. The Cão dos Mourey will do well in an apartment if it is sufficiently exercised. They are relatively calm indoors but will require a daily walk and some form of physical play exercise. Require a daily walk and play exercise. Cãos dos Mourey have a high prey drive so they enjoy chasing a ball or playing tug. Brush with a firm bristle brush two to three times a week. Bathe when necessary. They are average shedders. The foundation blood is mastiff, bulldog and terrier. The line is about 60% mastiff, 40% bulldog and terrier, consisting of the Brazilian Mastiff, Bull Mastiff and English Mastiff. The main goal was to re-create a mastiff type working dog prior to the 20th century. Some of the attributes from the mastiff are size, strength, protectiveness, loyalty, aversion to or dislike of strangers, and high pain thresholds. From the bulldog and terrier come agility, tenacity, determination and prey drive as well as many of the same traits found in the mastiff bloodline. The mastiff and bulldog were intimately linked many years ago. The modern English Mastiff and Bull Mastiff alone lack the sharpness and distrust of strangers that existed in the working dogs of old. 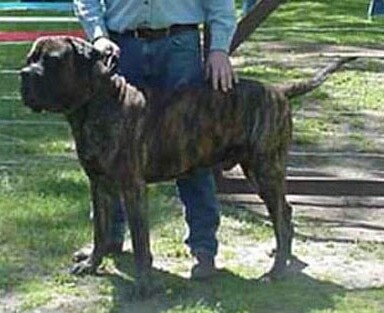 To re-introduce this sharpness, the Brazilian Mastiff was selected and added to the bloodline. This was the final addition in the line and the Cão dos Mourey was born. Nates Spitfire Jiggs is an outstanding example of a Cão dos Mourey.